Crabby Cook: Duck, Shrimp & Andouille Gumbo; It's the Super Bowl! 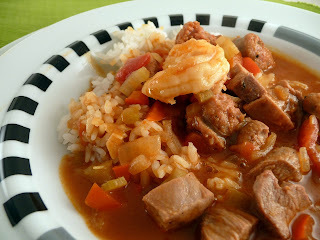 Duck, Shrimp & Andouille Gumbo; It's the Super Bowl! Wool of bat, and tongue of dog..."
Fenny snake? Eye of newt, toe of frog? Wool of bat, tongue of dog? What is this? Has Anthony Bourdain gone back to eating in Cambodia? Fenny snake? Do you have any idea how hard it is to fillet fenny snake? Look, I know the Super Bowl is this Sunday. I know you are all looking for that magic potion that will hypnotize your guests. I also know you're now pulling out your hair wondering why you agreed to have the party at your house. But fear not, Crabby's here! Then again, I do have some bad news. I don't do chili! It all tastes the same and, short of adding mouth incinerating amounts of hot peppers, it's always forgettable...until the next morning. Nope, today you're going to have to work. This recipe is involved. This recipe requires intricate planning. Success with this recipe comes from having your "place mis'd". Today we're going to make a quick gumbo. There's plenty you can do ahead. You can make much of it a few hours before the game and finish it when your guests arrive. In a large pot or Dutch oven (Le Crueset), bring the chicken broth to a simmer. In a small saucepan, melt the butter over medium heat. When fully melted add the flour, stirring constantly. Cook the roux until it turns a medium to dark brown, about 8 - 10 minutes. Set aside, roux can be made first, but kept warm on your lowest possible stove setting while you prepare the rest of the gumbo. In a large heavy duty pan, over medium-high heat, heat the vegetable oil and saute the onions, celery and bell pepper. Cook until the vegetables are just golden brown, about 10 -12 minutes. Add garlic to the veg and cook 2 minutes more. Add tomato paste and, stirring constantly, cook the mixture until it takes on a rich red/brown color, about 4 minutes. Deglaze the pan by adding the white wine. Scrape up any brown bits. Now, whisk the roux into the simmering chicken broth. Whisk vigorously to break up any lumps that may form. Add the vegetable mixture to the broth. Add the tomato puree and the ham hock & simmer for 15 - 20 minutes. While the stock mixture is simmering, heat a large saute pan over medium high heat and add the andouille sausage. Saute until cooked through, about 4 - 5 minutes. Keeping the fat from the sausage in the pan, add the andouille to the gumbo base. Reheat the andouille fat and add the duck breasts, seasoning each with salt & pepper. Saute the duck until just cooked through, about 4 minutes per side. Remove the pan from the heat and transfer the duck to a cutting board. Quickly dice the duck breasts into bite size chunks and add to the gumbo base. Don't worry if the duck appears underdone, it will finish cooking while simmering in the gumbo base. Reheat the saute pan over high heat. Season the shrimp with salt and pepper and add to the hot pan. Saute until just done, approximately 1 - 3 minutes depending on the size of the shrimp used. Add to the gumbo base along with the diced tomatoes. Add the hot sauce or serve on the side. Simmer all until heated through. Serve over white rice with plenty of beer. Watch the game. Whew. I know crablings, I know. But have the base ready late in the afternoon and then cook off the duck and shrimp at the last minute. But I promise you, this recipe beats the pants off of an ordinary chili. You can do it, you can cook! Shakespeare stole those lines from the Adaams Family circa mid 1960's. If you can find them, serve this with New Orleans beer, Abita Turbo Dogs. The dish has its roots in Paella from Spain. While in Spain I had a bazillion different Paellas, think going to Italy and every Nonna has her own red sauce/gravy recipe. 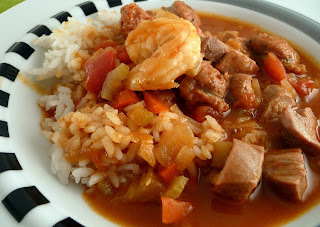 2007 vintage for inexpensive red wine from Rioja, Spain will be ideal with this yummy dish. If you feel like white, look for 100% Verdejo from the Rueda region of Spain. Tastes like a Pinot Grigio that someone grated fresh lemon zest into. If you can find these, do it; Dogfish 60, or 90 or 120 minute Beer from Delaware. Kwak beer from Belgium, wicked expensive, but worth it. Made this today. Used chichen breast instead of duck. Just tasted a bit and it is great. So good I had to comment. Thank you Crabby. Curious if you have any suggestions of something to use instead of shrimp? Let me know. If so I am making this for the super bowl! Lauren, the best idea I have would be to increase the amount of duck and/or sausage to make up for the removal of the shrimp. Any other fish will just disintegrate. Alternatively you could throw in some chunks of chicken or pork loin. Good luck, the recipe is a bit involved but comes out great!